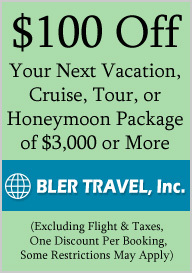 Welcome to BLER Travel website! BLER Travel Full Service travel Agency specializes in international travel, flights, hotels, honeymoons, vacations and wide array of specialty tours. Let the professionals at BLER Travel help you get around the globe to places like: Europe, Costa Rica, Caribbean, Israel, Brazil, Pacific Islands and the Far East. Or contact our professional Staff for: flight, vacation, cruises tour or any thing else. us your requested plans and your contact info and we will get back to you with best options. A Globus Cosmos tour or visit of your dreams! BLER Travel is pleased to offer you our exclusive, hosted cruise collection... Distinctive Voyages.